While some beginning concepts in this course may seem basic, they are keys to understanding the market as a whole. By having these basic ideas (or foundations) established early on, you can avoid many costly mistakes in the future. course will help you see and understand the longer term trade of the market. One of the most important requirements to take advantage of this course fully is to have an open mind. One analogy that often reminds me goes like this: “Your mind is like a parachute, it only works when it’s open”, therefore it is my sincerest hope that you keep your minds open. One of the biggest mistakes in Forex trading is ironically spending way too much time trading. There is absolutely no one who could predict with certainty where the market is going to do next, and by spending too much time trading, your chances of getting in a losing trade increases, not mentioning the stress associated with trading, which may very well lead to a lapse in your trading decision. My ideal way of Forex trading is knowing ahead when the market is going to move, get in the market during that window of opportunity, enter a trade, and then cash out once in decent profit. Rinse and repeat while spending usually no more than a couple of hours a trade, and no more than 4 to 5 trades a week. Scheduled Trading Time: You trade only the high impact news during their scheduled release time, which are available through various news calendars up to few weeks ahead of time, and you are in the market during a time where volatility is almost insured, with ample liquidity, so you don’t waste your time or your money chasing the noises or fake trends during low liquidity hours. Reduce Losses: Trading Forex is about having the odds stacked with you, not against you! By limiting the amount of trades you take in a month, you are cutting down your potential losses while picking the crème of the crop. High Profit: Since the market is likely to overreact to news releases, volatility becomes our friend. By getting in the right direction after the release, you can cash out on most of the movements. Less Time Trading: There are only about 35 tradable news releases a month, and out of these 35 releases, you’ll probably get 50% giving you a tradable release figure. So the tradable ones could take up to 2 hours per trade, but the untradeable ones should only take 15 minutes of your time. Therefore, you are averaging less than 40 hours of trading a month, or about 10 hours a week. While making probably the same amount of money you’d be making trading 16 hours a day. At the end of the day, it is not about the amount of time you spend trading, or if you used technical analysis or fundamental analysis. It is about what’s left in your account. 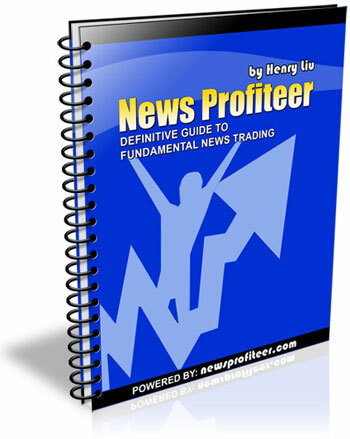 By concentrating only on news trading, you are looking at the simplest way and probably the most profitable way that I know of, in Forex trading.